To compare maternity care measures for hospitals in your area, including C-section rates, visit www.leapfroggroup.org/compare. The Leapfrog Group, a Washington D.C.-based nonprofit representing employers and other purchasers striving to improve health care quality and safety, released today its 2017 Maternity Care Report. Analyzed by Castlight Health, the report summarizes Leapfrog’s data by hospital at the national level, unavailable from any other public source. Rates for two major medical interventions in maternity care (early elective deliveries and episiotomies) have reached their lowest point since Leapfrog began collecting and publicly reporting maternity care quality data. Hospitals’ efforts to reduce their rate of early elective deliveries has been a tremendous success, declining to just 1.9% compared to 17.0% in 2010. The analysis also showed the rate of episiotomies has fallen to 9.6%. While this represents progress from the rate of 13.0% first reported in 2012, this rate is still significantly higher than Leapfrog’s target of 5% or less. The C-section rate of 25.8% is virtually unchanged from the prior year and is still higher than Leapfrog’s target rate of 23.9% or lower. "I'm inspired to see the rate of early elective deliveries decline to near zero, showing the power of transparency"
Mothers in certain states are at a higher risk for C-sections: NTSV C-section rates, measuring low-risk, first-time mothers with a single baby in the head-down position at term, varied greatly. 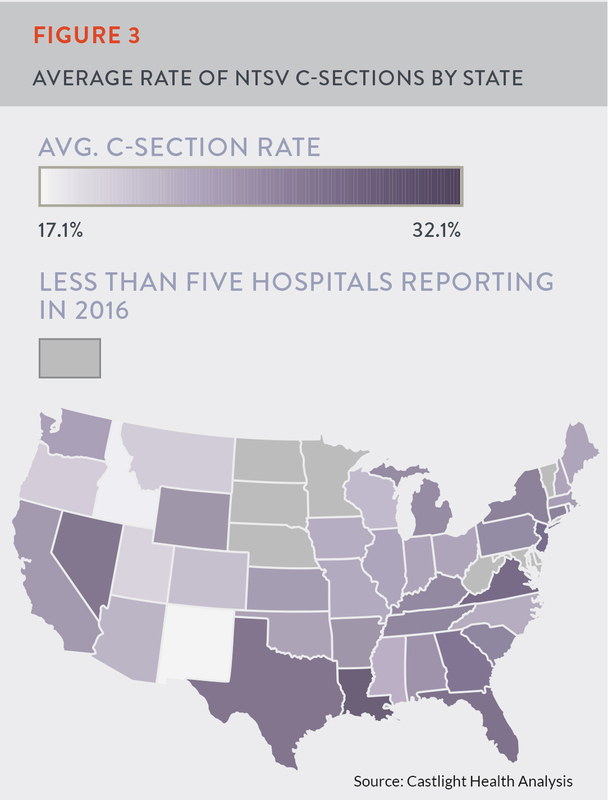 A higher percentage of NTSV C-section rates were found in eastern and southern states while western states tended to have lower rates. For example, New Mexico had a rate of 17.1% while Louisiana reported 32.1%, significantly higher than the Leapfrog target rate. Maternity care quality is unaffected by hospital type: When comparing teaching hospitals to non-teaching hospitals, and urban to rural hospitals, the report showed maternity quality performance data to be nearly identical. This provides evidence against common theory that particular hospital types provide better quality maternity care. More transparency and quality improvement are needed: Though significant improvement has been shown, hospitals still have work to do. Only 45% of reporting hospitals are meeting target rates for episiotomies, and even fewer – only 37% – are meeting Leapfrog’s standard for C-sections.